BELLE GLADE — Flanked by 6-foot-high weeds, the tidy handful of homes that make up Abidjan Estates are lonely outposts in a scarred landscape. Billed as the CityPlace of Belle Glade, the $65 million development's 70 acres were supposed to house 338 affordable homes and apartments, two swimming pools, stores, even a six-screen theater, all in a gated community. Despite hefty infusions of taxpayer money and private loans, though, Abidjan has had just 10 home sales in eight years. Its developer, deeply in the red, owes Palm Beach County and a state housing agency more than $750,000 - and is now in foreclosure, its land slated to be sold at a courthouse auction April 20 to satisfy a $2.4 million debt. How could Abidjan have gone so wrong? For its part, the county handed scarce taxpayer dollars to an inexperienced nonprofit developer headed by a disbarred attorney. It overlooked years of false starts and dubious financial management. And when confronted by alarming revelations five years ago, the county refused to launch an audit that might have revealed what went wrong. "I could tell from day one that that dog was not going to hunt," said Don Garrett, former mayor of Belle Glade. Belle Glade: View of trash surrounding an abandon but completed house in the Abidjan Estates development Tuesday in Belle Glade. The development has twelve completed homes. The rest of the land stands completely abandon with only turkey vultures for neighbors. member. Javin Walker, another Walker relative, is co-owner of the construction firm that contracted to work on Abidjan, and, with Dorothy Walker, co-owner of a mortgage brokerage headquartered in We Help's office. Board members brought troubling backgrounds to the table. Shirley Walker Turner led Palm Beach County's Head Start program in 1991 when a blistering audit of the agency's operations prompted calls for her dismissal. Then-lawyer Dorothy Walker was disbarred in 1988 in part because she accepted fees from clients, did not represent them and then refused refunds. She also was charged by the Florida Bar with lying to a local judge about whether she had hired an attorney for her brother Ralph Walker. At the time of his 1986 arrest on drug-trafficking charges, prosecutors said Ralph Walker was sitting at his kitchen table with others around a bowl of cocaine. One of them, a We Help board member between 1999 and 2003, was charged with cocaine possession but was not convicted. Ralph Walker was eventually convicted of soliciting to commit murder after he hired a fellow inmate to kill the judge in his case. According to prosecutors, he believed the judge had derailed Dorothy Walker's legal career. Ralph Walker's name appeared in 1999 corporate records as a board member of We Help; neither Walker nor Dorothy Walker could be reached to verify his former status as a board member. In all, at least three We Help board members had arrest histories, varying from grand larceny to burglary to battery charges. In 1999, the Palm Beach County School Board voted against a Belle Glade charter school that some We Help board members, including two with arrest histories, were trying to get off the ground. District staffers voiced concern that the school's organizers might not spend the money wisely. Ralph Walker stepped down from We Help in 2000; three other board members with arrest backgrounds stepped aside in 2003, the same year the county approved $600,000 in federal money for Abidjan. The loan coincided with a $250,000 loan from Belle Glade. Millions from state and private sources followed. Remar Harvin, then Palm Beach County's head of Housing and Community Development, said he was unaware of the arrest histories. And any misgivings about a lack of development expertise or past financial management were swept away by community-wide support, a "show of force," said Harvin. He acknowledged there was risk. "We knew the developer would need some training, but with the backing of community leaders; well, if we don't take a chance, who was going to?" As for Walker's lack of experience, "She was one of the few people interested in doing anything in the Glades," Deputy County Administrator Verdenia Baker said in 2006. With etched glass front doors, granite countertops and raised wood finishes, Abidjan homes don't look like affordable housing. Named after the capital of Africa's Ivory Coast, the small cluster of houses looks like any other well-manicured subdivision. But they are bounded by fields of weeds and rubbish. The entrance to the homes is dirt and gravel, the welcoming sign - "Abidjan: a New Beginning for the Glades" - is fading and partly obscured by unmowed grass. On a recent day, turkey vultures perched on a pile of unused building material. Between 2008 and 2010, in the middle of the cratering housing market, five Abidjan homes sold for $195,000; five sold for $210,000. That's despite the fact that the median sales price of a home in economically distressed Belle Glade was $135,000 in 2008 and 2009. It dropped to $74,000 last year, the same year two homes in Abidjan sold for more than twice that amount. All 10 homes are now valued at less than $100,000 each. Problems started long before home sales materialized. In 2006, a deal to reserve Abidjan homes for Palm Beach County teachers fizzled. The school district would pay $60,000 so teachers got first shot at 30 of the first phase of about 76 homes. But two years after ground was broken, only about 10 homes were under construction, and old questions about Dorothy Walker's background surfaced. The district walked. Also in 2006, Belle Glade officials found We Help had tapped into city water lines without permission: It had not paid permit fees or even picked up a water meter. And a city commissioner who went to inspect the water lines was threatened with a trespassing charge. We Help, which said there was a verbal understanding with the city to waive permitting fees, eventually paid the city $23,743 for the water. After a 2006 city commission meeting marked by bitter debate on the water issue, commissioners broached the idea of a limited audit. There's no record of an audit, according to Belle Glade officials. The county balked at joining a comprehensive review, even though it had sunk hundreds of thousands of dollars into Abidjan. "Our investment is secure," the county's Harvin said at the time. Now, however, most Abidjan land is being seized by an unpaid lender. The foreclosure is not expected to directly affect the homes already sold. Asked about the future for the rest of Abidjan, however, the lender declined to comment. We Help's future looks almost as shaky. It has run between $200,000 and $300,000 in the red every year for three years. "Through prayer, that is how we are making it," said Dorothy Walker. "Through prayer." Walker ticks off a litany of problems that have stalled development. The city initially goofed on zoning. "We had to stop and start over again." 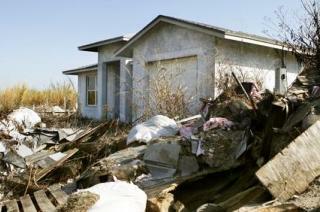 Hurricanes in 2004 and again in 2005 hit hard. "So then the process stops again." By then, people who had been previously cleared to buy homes had new credit problems. "We had to start over with a new set" of credit applications. There were problems with mapping the land. Unemployment in the region hovered at 40 percent. Finally, "The whole housing market went down." Walker makes no apologies for the cost of the homes, which are 43 percent higher than the initially proposed $135,000 for a three-bedroom and $145,000 for a four-bedroom. The price reflects construction costs, she said: Muck, the soggy black soil that gives Belle Glade its rich agricultural fields, also makes it harder to pour foundations that don't sag or sink. At least $500,000 in loan money has been repaid, including all but $5,000 of the city's money. But the state housing agency is still owed more than $300,000; Palm Beach County is owed $521,000 and We Help is broke, more than $310,000 in the red, according to its most recent tax filing. Dorothy Walker, paid $105,000 in 2007, was paid just $24,000 in 2009. "I have staff who come to work and who will not get paid," said Walker. Yet, even as a lender foreclosed, We Help has been spending. Of its most recently reported $235,000 in expenses, $90,326 was for administrative overhead. Last year it picked up a one-bedroom, one-bath condo at Spa at Sunset Isles in Royal Palm Beach and a four-bedroom home in Wellington. Debts aren't restricted to payments on those properties or on Abidjan land. We Help owes $34,000 to the construction company co-owned by Javin Walker. And in recent tax years, it has racked up debt on two American Express cards, a Visa, a Capital One, Citibank credit cards and a Citi Platinum Select card. We Help sought financial help from a familiar source last year: it had hoped to tap into additional county housing money. Though it came up empty-handed, Walker said, "We have grant requests and loan requests (outstanding) and you cannot pray as hard as we are praying without something happening." With the land sale in 10 days, time is running out. In the meantime, We Help is keeping busy: It is still accepting home loan applications.